Outside: The Official Rules of Peek-A-Boo. Peek, Boo, "Peek-A-Boo". A game of intrique suitable for ages 0 and up. 1. Peek-A-Boo requires two players, a Peeker and a Boo-er. 2. The Boo-er hides his or her face behind both hands and "disappears". 3. 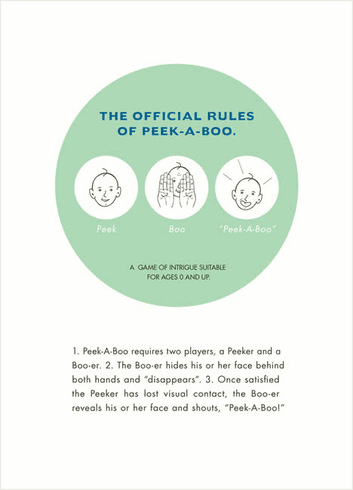 Once satisfied the Peeker has lost visual contact, the Boo-er reveals his or her face and shouts, "Peek-A-Boo!" Inside: You're in for some fun. Congradulations on the new baby.